Mt. 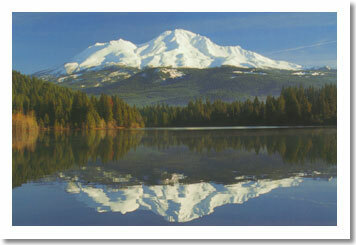 Shasta - Mt. 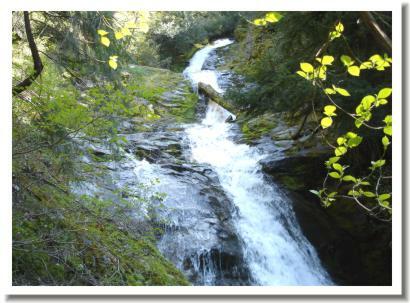 Lassen - Waterfalls - City Pictures - Castle Crags - or, View all Homes and land for sale in the Redding Area. north yet slightly east. 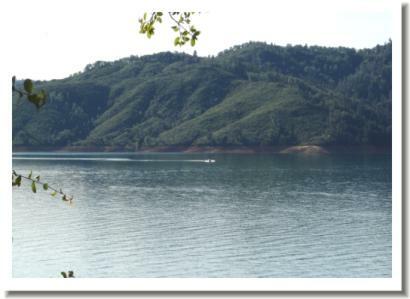 With a reported depth of over 500 feet at the dam and 365 miles of shoreline, this is a very large lake. 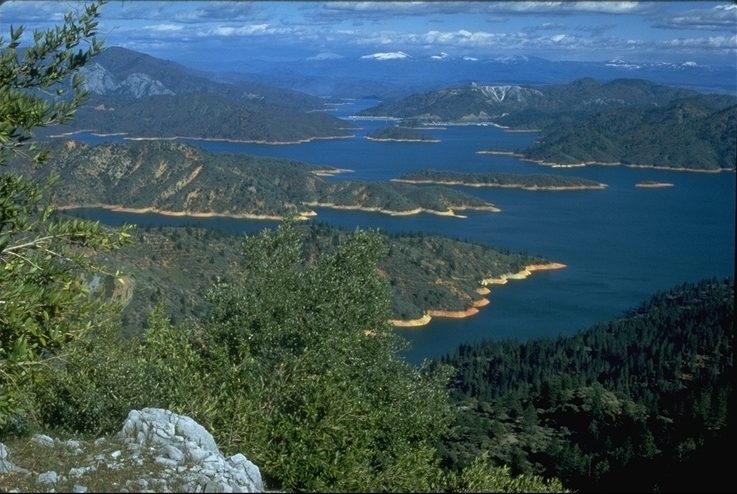 Shasta Lake resides within the boundaries of the Shasta-Trinty National Forest which encompasses more than 2.2 million acres. That number is difficult to put in a mental image, lets just say there is a TREMENDOUS amount of open land in our portion of the state. 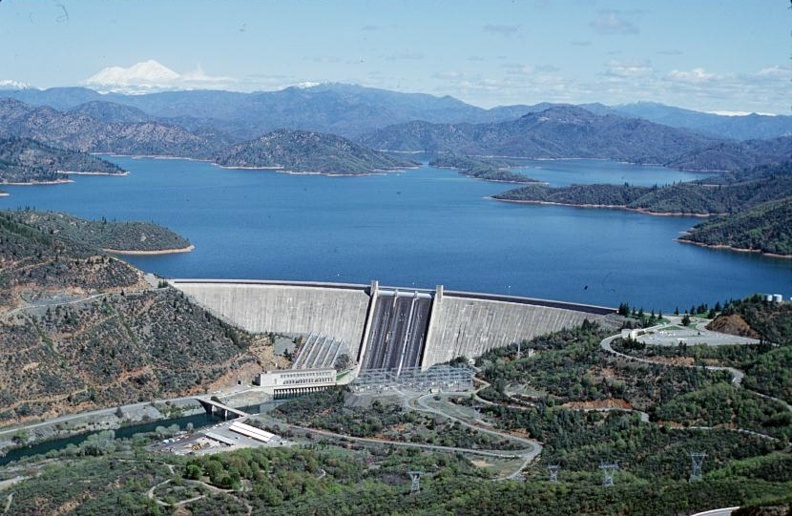 In this view you can see Shasta Lake with Shasta Dam just out of range to the right. 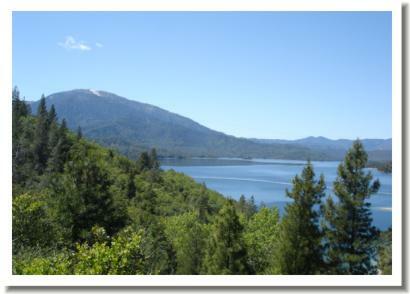 Bridge Bay Resort and the Interstate 5 Bridge crossing Shasta Lake (center near the top). The rock formation to the left is Shasta Caverns. Mount Lassen is hiding in the clouds in the distance. 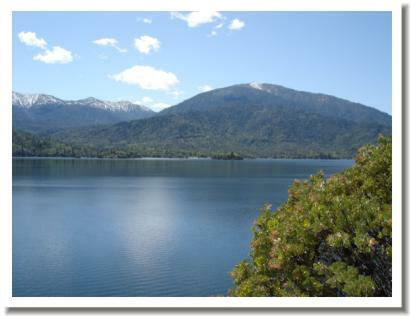 Don't be fooled by these two pictures because there is a lot more lake than what is showing. 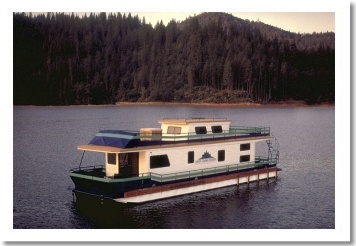 Houseboats and Shasta Lake go together like cake and ice cream. 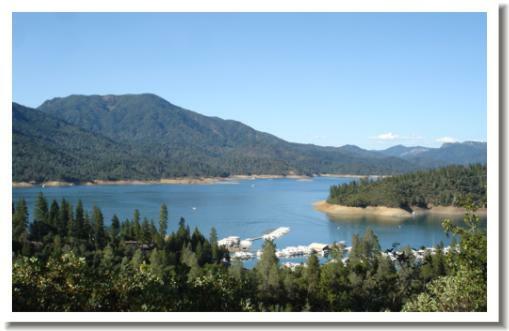 You'll find Houseboats at various marinas around the lake, and I have heard that Shasta Lake hosts the largest fleet of Houseboats in the nation. some years dramatically, others not too much. 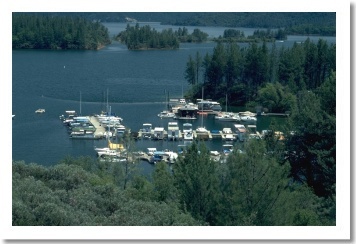 Here you are looking at Silvertorn Resorts docks and houseboats. 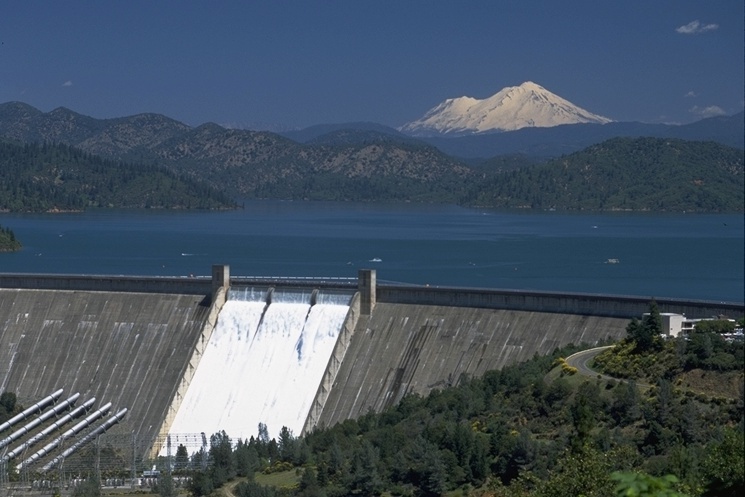 In a very rare spring the operators of Shasta Dam will allow the flood gates to open for a short time, it sure creates a beautiful picture. This is rare because the water that flows over the gates means it's not flowing through the generators attached to the "tubes" you see in the lower left corner. It looks very tempting doesn't it, maybe its time to make a move. Contact Eric Lewis. 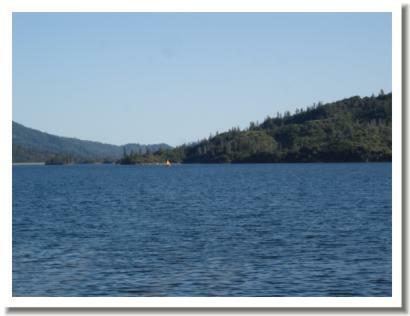 Whiskeytown Lake with Mt. Bally in the background. 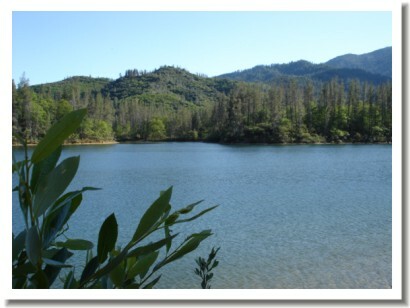 This is a beautiful lake just 10-15 minutes from Redding. 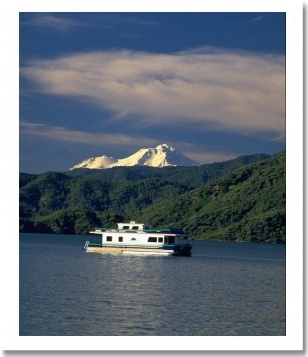 A great place for boating, canoeing, kayaking, swimming and more. Thinking of making a move? Contact Eric Lewis (530-227-7722) for Real Estate. 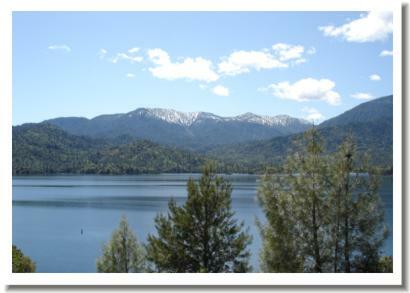 This Lake is in the mountains southeast of Redding and takes about 90 minutes to drive to. Sitting high in elevation with a great view of Mt. Lassen it's a great summertime getaway. 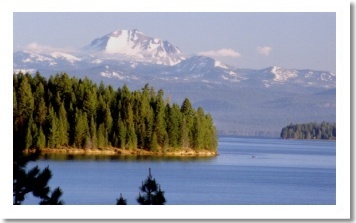 Mountain lake just out of Mt Shasta. 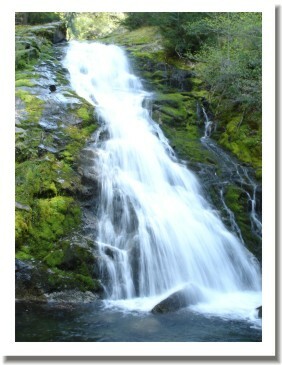 Below the dam is Box Canyon, it's very deep and narrow. 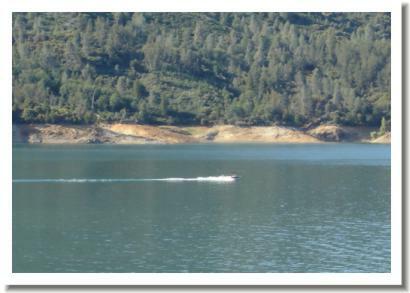 The lake is restricted to motor boats going no faster than 10 mph maximum. 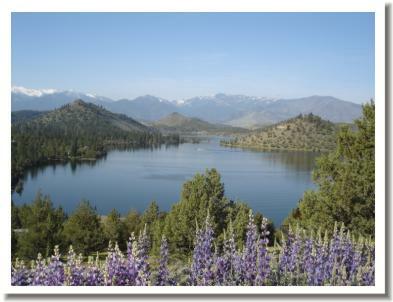 Near Weed California is Lake Shastina and the community that surrounds it which includes spectacular views of Mount Shasta and a Robert Trent Jones designed golf course. 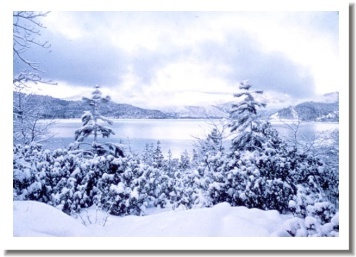 This photo shows the lake in the spring and full. This lake is relatively shallow and drops as the year progresses, as the water recedes it reveals a large amount of ground.